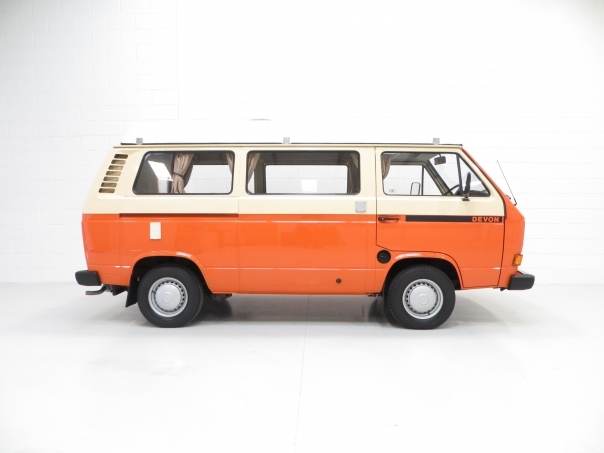 An award winning original VW T25 Devon Moonraker with just 20,139 miles. Safety cell cab construction, engine access hatch, cab heater, electric mains hook up, bottled gas supply, ZIG C.F.8 power supply and remote charging, sophisticated electrical control system, lighting, offside kitchen, heat-resistant melamine work tops, cutlery drawer, gas cooker with grill and heatshield, sink and drainer unit, large 34 litre wheeled water storage tank, grey water outlet, deep storage locker, wardrobe, vented gas bottle storage, double bed/rear bench assembly, rear facing seat, extension ‘buddy’ seat, under-seat storage, centre leg table, roof cabinet, continuous track curtains. 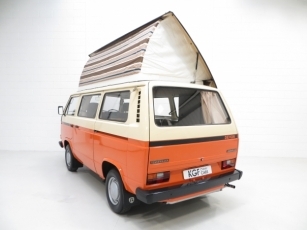 Devon Double Top fibreglass roof, solid base roof mattresses, roof vent with fly screen. Factory options; Electrolux RM122 model 12volt/gas refrigerator, Espar B1l/D1L petroleum heater. 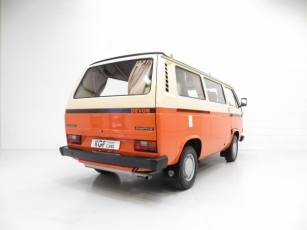 This exceptional example is a genuine Devon Moonraker conversion from new and has remained completely original. 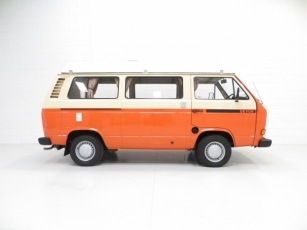 The two tone paintwork in Brilliant Orange and Ivory, (Code L20B/L567), boasts a vibrant shine and superb finish with only a few miniscule blemishes. 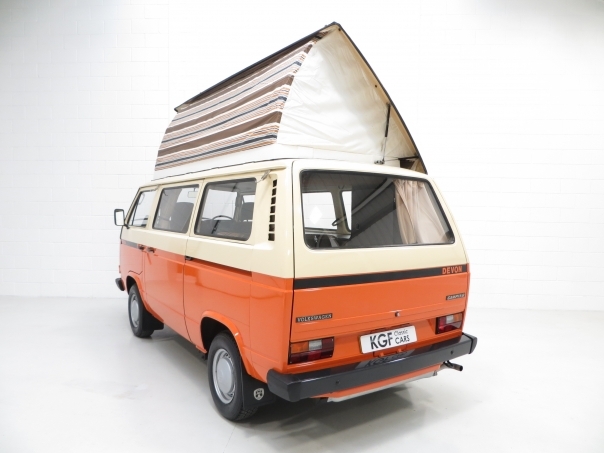 Incredibly, original features such as the supply dealer number plates, tyre pressure stickers on each wheel arch and original Devon decals are intact and preserved. Structural integrity is assured due to Ziebart treatment from new, and multiple Ziebart plugs and evidence of factory wax can be seen. All original panels are pin straight with uniform shut lines and the trim sections are beautifully preserved. A truly amazing example presented in impeccable order. 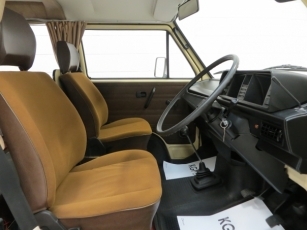 The spacious cabin consisting of Brushed Nylon front seats and heavy duty moulded rubber floor coverings remain factory perfect. The seat coverings are amazingly clean, reflective of the very low mileage covered, and the steering wheel still shows prominent factory veins. A light mark to the passenger seat can just be seen. Original features such as the fully operational Blaupunkt Toronto SQR32 stereo and all factory stickers remain. Furthermore, the factory identity plate and paint code sticker are underneath the passenger seat, alongside the separate leisure battery correctly installed in conjunction with the ZIG C.F.8 power supply and remote charging system. A period digital TIM Tach gauge has been professionally installed. 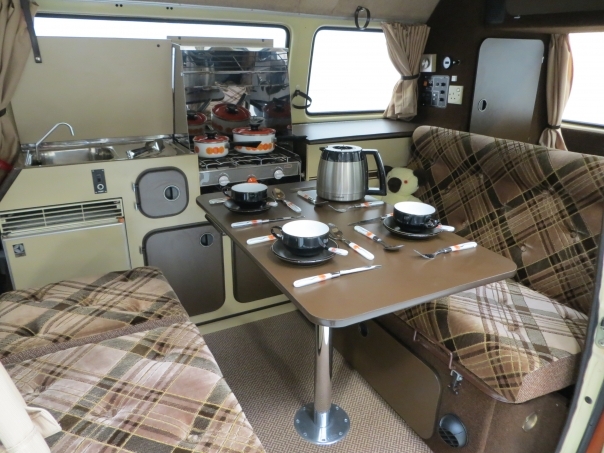 Exceptional design and build quality from the renowned experts, Devon Conversions Ltd, this pristine example has remained precisely as per the build specification. All soft furnishings consist of buttoned deep foam cushions trimmed in ‘soft as velvet’ pile patterned fabrics which remain in fantastic clean unworn condition. The Flotex floor covering to the living area is spotless having been protected from new with an overlay mat, and even the usually misplaced small wooden bung with matching Flotex top remains in situ where the removable table leg sits! The Coffee and Cream cabinets with melamine work surfaces, along with all clips and catches are pristine and fully intact to further emphasise the first class mentality to the Devon Conversions product. 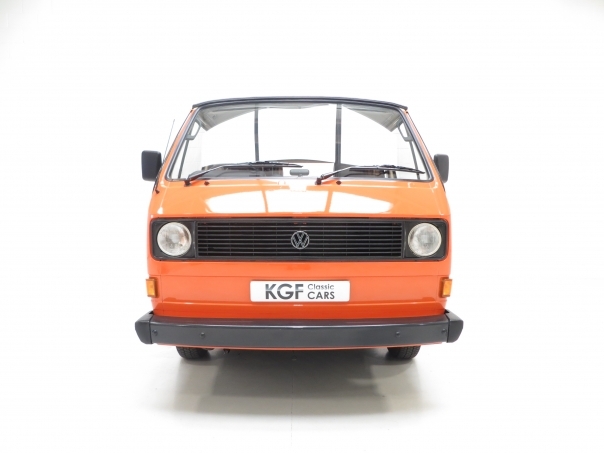 All spotless cooking, washing and heating facilities are intact and operational but have not been tested for performance or safety by KGF Classic Cars. Dealer supplied cookware and matching cutlery are delightfully period! The Devon Double Top fibreglass roof with bright and fully intact striped canvas raises effortlessly to facilitate spacious daytime full standing headroom and versatile adult double or twin child bed configuration. Rich carpet style trim to the interior panels, in Dark Brown below and Beige above the window line, is pristine with no signs of leakage. An outstanding example worthy of the label ‘time warp’. The four cylinder air cooled 1970cc petrol engine with twin down draft carburettors develops 70bhp at 4200rpm and 137Nm of torque at 3000rpm. The engine hatch remains the correct factory grey and lifts to reveal a wonderfully clean and unmolested engine bay with factory stickers and markings still intact. Even the often perished rubber concertina engine seal, essential to prevent hot gasses rising from the exhaust, is fully intact. The baulk synchronised 4 speed manual gearbox offers sturdy yet effortless changes. Simple mechanics and a huge parts supply network make this a very capable useable classic. Standard 5½ J X 14 steel rims are dressed with pristine VW hubcaps all round and incredibly still wear the factory Michelin XZX tyres! Although hugely desirable to a collector and important to retain, tyre renewal prior to regular use would be a prudent safety precaution. The original unused spare wheel is stored in the underside hanger and the original VW toolkit and jack are present, including the very rare wheel hub pick! Servo assisted brakes with front discs stop the vehicle in a steady and straight line. This factory built T25 Devon Moonraker was supplied new on 14th March 1980 by Main Agent, William Arnold Caravans of Manchester. 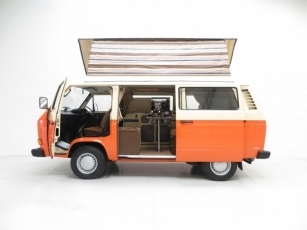 The first owner was a Mr William Smart who initially registered the vehicle in his company name, Eurobake Ltd, before transferring ownership to himself. Mr Smart kept the vehicle inside his warm bakery throughout his 21 year ownership, after which it was purchased by Mr Adrian Royles. 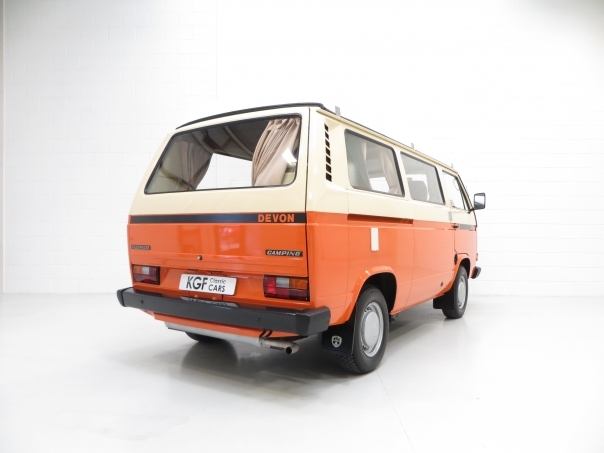 Five years on, the previous owner, Mr Craig Wall, discovered the vehicle after a long and exhausting search for the best T25, and it was just four miles away in a dry garage he walked past every day! 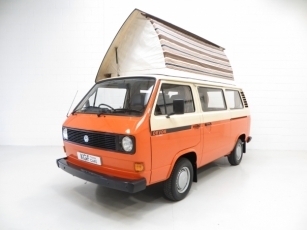 The history file consists of all Volkswagen handbooks, guides and leaflets in the William Arnold plastic wallet, along with the instruction manuals for the camping facilities. Even the Salesman’s business card, with his photo, has been kept! 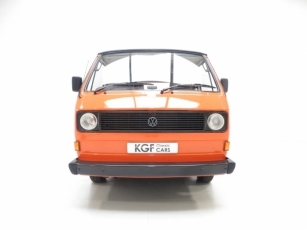 A large collection of MOT certificates and invoices verify the incredible low mileage of 20,139. Two sets of keys and a laminated period sales brochure complete the history file, along with trophies awarded at various Volkswagen shows, including the prominent Tatton Park 2013. 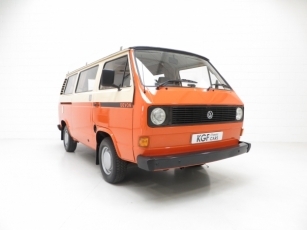 This example is guaranteed to attract appreciation from enthusiasts and collectors wanting simply the best on offer.